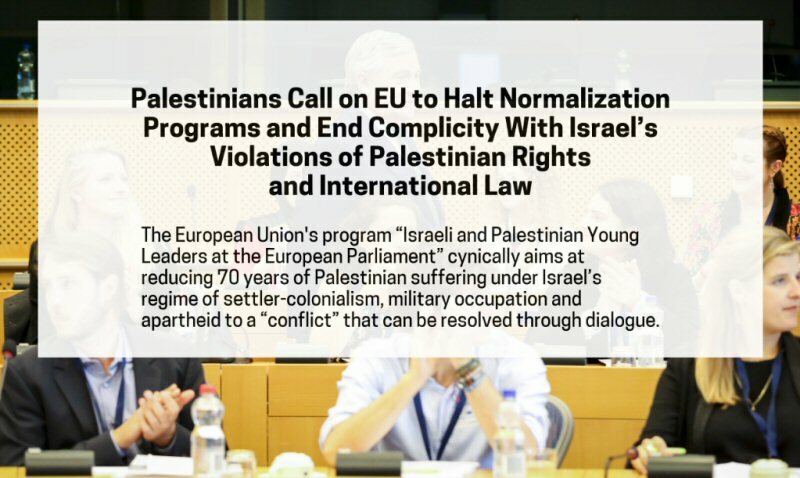 The European Union’s program “Israeli and Palestinian Young Leaders at the European Parliament” cynically aims at reducing 70 years of Palestinian suffering under Israel’s regime of settler-colonialism, military occupation and apartheid to a “conflict” that can be resolved through dialogue. On the 13th of August 2018, the Palestinian Campaign for the Academic and Cultural Boycott of Israel sent a letter to Mr. Ralph Tarraf, the Head of the EU delegation in the West Bank and Gaza, among other EU officials, regarding the EU program “Israeli and Palestinian Young Leaders at the European Parliament”. The letter pointed out that the program violates the relevant BDS guidelines agreed upon by the vast majority of Palestinian civil society. The letter also stated that the EU and its programs are highly complicit in Israel’s violations of Palestinian rights and international law. This program cynically aims at reducing 70 years of Palestinian suffering under Israel’s regime of settler-colonialism, military occupation and apartheid to a “conflict” that can be resolved through dialogue. The letter called on the EU to end all forms of complicity and to halt all its normalization programs. The campaign has received no answer from the EU delegation. We therefore share the letter publicly so that Palestinians and Europeans alike will realize how harmful these EU-funded normalization projects are to the popular Palestinian struggle for freedom, justice and equality. PACBI calls on all Palestinian participants to withdraw from this normalization project to avoid becoming themselves complicit in undermining the Palestinian struggle for our inalienable rights under international law. The Palestinian Campaign for the Academic and Cultural Boycott of Israel (PACBI), a member of the Palestinian Boycott, Divestment and Sanctions National Committee (BNC), the largest coalition in Palestinian civil society, would like to point out that your program “Israeli and Palestinian Young Leaders at the European Parliament” to be held in December of this year, as we learned, violates the boycott and anti- normalization guidelines agreed on by the vast majority of Palestinian civil society. This program aims at bringing together Palestinian and Israeli young leaders on a joint trip to the EU headquarters, to familiarize them with the mechanisms and different bodies of the Union. The participants will then engage in joint discussions with members and representatives of the EU, encouraging them to share their views on the future of the “conflict” with their Israeli and European counterparts. The reduction of 70 years that Palestinians have suffered under a settler colonial occupation, to a conflict resulting from a psychological barrier that could be eliminated by joint dialogue amongst two equal parties, which this program tries to achieve, falls under the definition of normalization, an act rejected by Palestinian civil society. These attempts give a false and distorted picture of the Israeli occupation and Apartheid regime, which has recently escalated its ethnic cleansing policies against Palestinians, i.e. what is happening now in Khan Al- Ahmar, the Jordan Valley and Negev. During a time in which Israel is adopting the racist “Jewish nation-state” law, which turns apartheid’s policy into a constitutional law, and while it continues its crimes against peaceful Palestinian demonstrators in the Gaza Strip for the right of return and ending the siege, the EU must stop its disgraceful complicity with these crimes instead of financing projects aimed at covering the face of this colonial and racist system. The EU maintains a network of military relations, arms research, banking transactions and trade with settlements, and with Israeli companies, banks and institutions deeply complicit in human rights violations. For example, the EU imports goods from Israeli settlements with an annual estimated value of $300 million. This is more than 17 times the average annual value of Palestinian goods imported by the EU between 2004 and 2014. Through its program “Horizon 2020”, the EU has approved more than 200 projects in collaboration with Israeli companies such as Elbit Systems and Israel Aerospace Industries, accused of deep complicity with Israeli war crimes and crimes against humanity. The other beneficiary of EU funding is the Technion, a major center for the development of Israeli weapons systems used to commit crimes against Palestinian civilians. Despite the pressure placed on the EU by hundreds of trade unions, European civil society organizations and more than 60 members of the European Parliament, it still has stubbornly refused to enforce the human rights clause in the FTA with Israel. This continued even after a legal report published by a UN agency last year revealed that Israel had established a system of apartheid against the entire Palestinian people. Apartheid is the second most serious crime against humanity in international law. The EU continued support for the Israeli occupation and apartheid regime makes it a partner in crime, despite its occasional empty declarations calling for the achievement of a just peace that respects the rules of international law and the principles of human rights. Therefore, we call on the EU to stop all aspects of its complicity with Israel’s occupation and apartheid. We also call on it to stop all similar normalization projects aimed at perpetuating this occupation regime, at a time when the European people are calling for holding it accountable and imposing sanctions on it. Such a call is similar to those imposed on the apartheid regime in South Africa in the past, and on some countries nowadays, for their violations of human rights. If the EU is indeed concerned with playing a positive role in supporting the march of freedom, justice, equality and human rights of the Palestinian people, then, the time has come for it to end its complicity and double standards. Via the official BDS National Committee website.